A few weeks back I was spending my days soaking up the sun on the beach and my afternoons checking out hidden restaurant gems in Delray Beach. One of the places we stumbled upon was an all natural, organic cafe that had both healthy and intriguing flavor combinations. At the time, the idea of consuming a big bowl of hot soup after sitting on the beach for 4 hours was not appealing to me. But when I returned back to the Midwest and snow was covering everything, I couldn’t help but have my mind wonder to that menu and this soup. 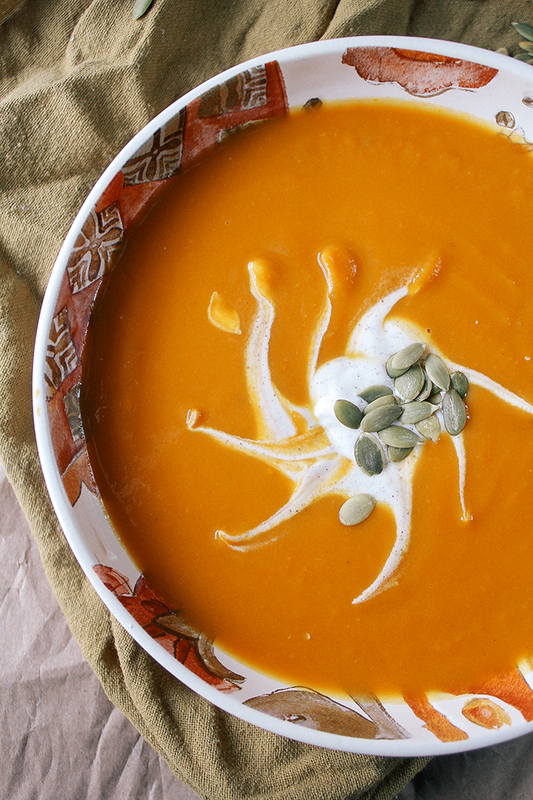 This soup is pretty sweet so I recommend pairing it with a tangy grilled cheese or some hearty toast. 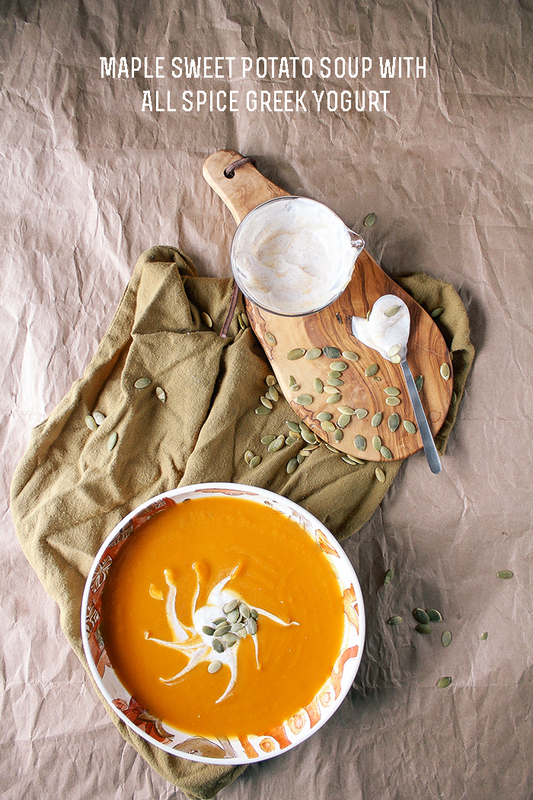 You can also fancy it up by substituting the greek yogurt for crème fraîche or roasting the pumpkin seeds in spices. It also makes wonderful leftovers and can be reheated for weekday lunches. Oh…and did I mention that it’s chocked full of protein and vitamins (specifically B6 and C)? How can you go wrong? Heat the butter and olive oil in a large saucepan. Add the onions and cook until translucent (about five minutes). Next, add in the sweet potatoes and maple syrup. Let cook for 15 minutes or until everything has browned. Add the broth and bring to a boil. Reduce to a simmer and cook until the sweet potatoes are soft (time will vary depending on the size you cut your sweet potatoes). Remove from heat and use an immersion blender to blend until smooth. If the soup is too thick then return back to stove and add a little more broth (about 1/4 cup at a time). Cook over low until a desired consistency is reached. Season with salt and pepper. Combine the greek yogurt and all spice in a bowl. 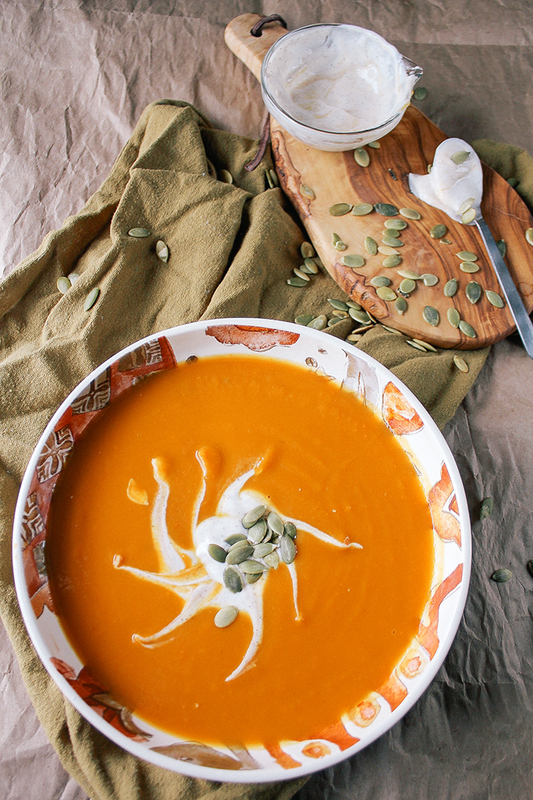 Garnish the soup with it and some toasted pumpkin seeds. Serve warm with fresh bread or a grilled cheese.